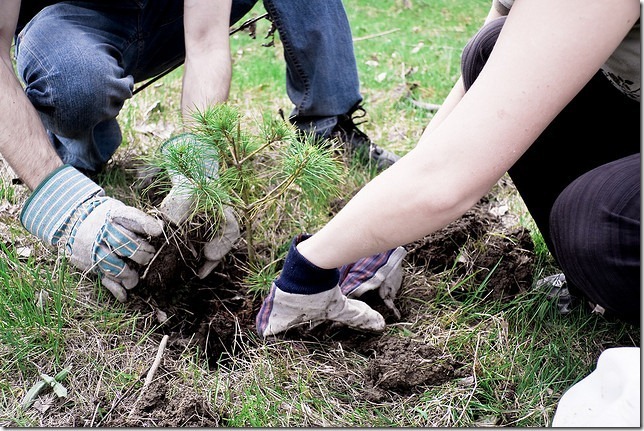 This blog is about positive things people can do for the environment – so I hope you’ll forgive a bit of cynicism over Environment Week, held in Canada every June and this year from June 5-11. The press release about Environment Week from Canada’s Minister of Environment says “Canadian Environment Week is a call to action to all Canadians to get involved, to adopt a greener lifestyle, to celebrate actions that promote a cleaner environment and inspire others to do the same.” The City of Ottawa, quoting Environment Canada, says this week is a time to “celebrate our achievements and initiatives,” noting that the 2011 theme of Environment Week is Preserving our Forests, Protecting our Future. It sounds good. But this is the same city government that allowed the Beaver Pond Forest to be cut down in January, just as the UN’s International Year of Forests was getting underway. The City of Ottawa’s big Environment Week announcement this week? The launch of a Tree Watering Bag Pilot Project that will attach polyethylene containers full of water to 1,500 new city trees as a way to water them more effectively. Growing trees, conserving water and doing so cost-effectively are good, but isn’t it a bit like fiddling while Rome burns? The federal government, meanwhile, cut 50 Environment Canada staff last week on the eve of celebrating that department’s 40th anniversary. The Canadian government has been criticized internationally for inaction on climate change, and challenged to protect species at risk. Sure, we can do more as individuals. But what difference will it make without corresponding measures at municipal, provincial and national levels? Maybe the answer is in how we as individuals and communities come together to keep decision-makers focused on the things that matter to us, like the environment. If so, then Ottawa does have something to celebrate. Groups like Sustainable Living Ottawa West, Sustainable Living Ottawa East, Transition Ottawa, Ecology Ottawa, Just Food and many others that not only support us to adopt more sustainable lifestyles but also give us a way to come together. Bloggers who share their ideas and efforts to live “green” (like those mentioned in an earlier post and comments on it), and people who take the time to read them. Community associations and environmental organizations who monitor what our governments are doing and take action when they see governments falling short. “A voice that says that the protection and preservation of native heritage is important because it strengthens us all and teaches us many things. A voice that says that we too are an integral part of this natural ecosystem. We do not walk on it, we exist within it and we are only alive because of it. A voice that says that our society must return to a ‘sustainable relationship’ with all living beings – regardless of colour, creed, and culture, and with respect for all species of life. A voice that says that greed is no substitute for responsibility. Perhaps, then, this is how we should mark Environment Week: by celebrating the people and groups in our city who act individually and collectively to protect our environment and to remind our governments of their responsibilities. Denise, you are right on as usual…if you read the press release it seems the federal government is saying that we can be as green as we want, but we are on our own. So we put a bit of grrr in the green, and carry on despite them. Thanks for your terrific comments! Wednesday, June 22, 6:00 pm – Rally in support of the South March Highlands at All Saints High School, 5115 Kanata Ave.
Wednesday, June 22, 7:00 pm – Public Meeting on the South March Highlands at which KNL Developments will present their plans for development of lands by the Beaver Pond, All Saints High School, 5115 Kanata Ave.
Thursday, June 23 6:00 pm – Community Gathering and Sacred Fire at Beaver Pond Park, 243 Walden Dr., Kanata – a celebration of the South March Highlands.